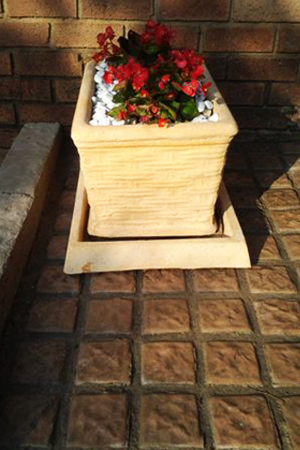 Lacotta Cobbles create the most attractive driveways to give your home or office that final touch of style. The authenticity of the Lacotta cobble lends itself to areas where a true stone finish is required to blend with buildings of distinction and contemporary classicism. Lacotta cobbles are designed and manufactured at our premises and exceed the requirements of the Cement Institute. They have an average strength of 48 Mpa and come in various sizes. Cobbles are laid the same way as traditional paving is laid, onto compacted ground with a bed of river sand and cement, packed tightly together. The cobbles are then compacted with a rubber mat in between the compactor and the cobbles until leveled. The cobbles are then grouted using plaster sand and cement. As with all Lacotta products, Lacotta cobbles are handmade.